Lucinda Williams framed the phrase ‘down where the spirit meets the bone’ in the title of her 2014 album. If you were to discover such a place, Courtney Marie Andrews would be there scribbling in her notebook before wrapping the words around her vocal chords. Those cast under the spell of her previous record will still be locked in a cavern of soulful song-writing bliss as MAY YOUR KINDNESS REMAIN gets the album handover. It is a case of striking while the creative iron is hot as the antithesis to romanticised Americana feasts on the currency of kindness and hope. The intensity and capacity to move runs rapid across the ten tracks, without the slightest trace of being “overwrought”. The search for the album’s beacon stops abruptly at the jaw-dropping momentous ballad ‘Took You Up’, which has the capability to break each listener with every play. Right from the opening line ‘is it the journey or the destination’, the instant gift of song writing nirvana has been found and we are exposed to the starkest of relationship analysis. From ‘cheap motels, diners and dives’ to ‘wouldn’t trade love for a million bucks’, the analogies relentlessly flow amidst a stirring soundtrack awash with gorgeous melodic breaks. This song is up alongside Brandi Carlile’s ‘Sugartooth’ as the best track heard for ages and is in no danger of removal from a year-shaping list. Courtney Marie Andrews may have come to prominence with the release of HONEST LIFE, but there is a lengthy trail of exposure to the world of a working musician over the last decade. Without doubt, this experience filters into the song writing process and she certainly has a priceless knack of capturing her feelings in the sung word. 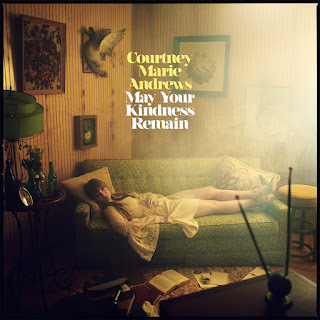 Evidence for the case of removing iconic namechecking is almost complete to the extent where artists in her tailwind will soon be citing the name Courtney Marie Andrews. Four tracks have surfaced online in the run up to the album release headed by the title number ‘May Your Kindness Remain’. An extraordinary perception to draw positives from advancing flaws is a trait in the writing process, and this song leads the way. The most recent album leak was the ironic ‘I’ve Hurt Worse’, which sees the vocals slightly soar and the fortitude of the artist spill over. Doubling up on the kindness theme is another previewed piece ‘Kindness of Strangers’. This is probably one of the fuller sounding tracks on the album, complete with extra additional backing vocals and an instrumental accompaniment marrying keys, strings and percussion. Courtney’s lead vocals push a little harder here without losing any of the sculptured elegance. My second favourite track on the record is ‘Two Nights in Buffalo’. This was heard first when featuring in the set at Moseley Folk Festival last September and made an instant impression. The availability of repeat plays confirms this initial promise. While every sympathy is offered to the city in question (the second time it appears in my collection after Amanda Shires’ ‘Detroit or Buffalo’), it is refreshing for somewhere else other than Cleveland to attract the song writing blues. Courtney does not refrain from dishing out some near clichés in ‘wrong side of the tracks’, ‘mom and pop, 5 and dimes’, but the vision painted from this punchier song portrays the message. Everything about the infrastructure to this album seems to fall into place: ten tracks, forty minutes, inspiring lead off title track and the essential climactic closer. ‘Long Road Back to You’ unveils as a mini epic in this role. Passion, feeling and a killer chorus all add to the mix as we get the perfect send off, or hit the repeat button if you have some sense! ‘Border’ and ‘This House’ were two songs Courtney presented to a live audience when she played a fabulous solo gig in Oxford recently. The first of these takes a social look at the immigrant attitude that blights parts of the States, in this case close to the Arizona home where she was raised. The second brings the theme back into the realm of the personal vicinity and how sometimes you just have to treasure what you have – warts and all. This is an aspect of Courtney’s writing in which she really excels. ‘Rough Around the Edges’ gets the widely used piano intro plus its major accompaniment, and rolls out as a trademark Courtney Marie Andrews piece. The piercing vocals convey the passion of the song and demonstrate that soul music can come in many different forms. It is just an innate trait that certain performers effortlessly pour into their musical art. ‘Lift the Lonely From My Heart’ is the final track mentioned, but could quite conceivably be the first in likeminded reviews. Here, organ and Wurlitzer makes a further soulful impression and the emotive spark off the album gets a touch fiercer. MAY YOUR KINDNESS REMAIN is the perfect embodiment of the heartfelt song. It weaves in a thread of art and reality, tearing up the singer-songwriter genre in a similar vein to her iconic American predecessors. Its ability to convey a multitude of messages awash with life’s imperfections tints it with an anti-corporate stance. Delicately sung and immaculately presented, Courtney Marie Andrews is the architect of a record that should act as a country/folk blueprint in 2018. A journey, a journal, a lesson, this album is a classic.